One Tonne Life is a project initiated by A-hus, Vattenfall and Volvo Cars. Each of these three organizations play an integral role in the Lindell’s potential success for reaching their goal. 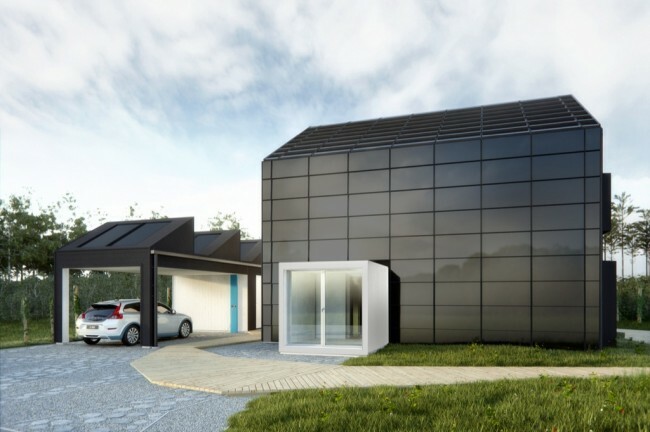 A-hus provided the construction of the wood-framed house, Vattenfall much of the technologies used for energy production and monitoring, and Volvo with their C30 electric car. A-hus created a pretty rockin’ abode for the One Tonne project. The structure is not only beautiful, but packs a high performance punch. Architect Gert Wingardh designed the home with a well-insulated, leak proof frame, making sure that every bit of energy stays as long as it can inside of the home. One strategic way this was accomplished was the addition of an entry porch that has two doors, eliminating the amount of cold air that is brought into the home on those cold Sweden days. Similar to this concept are window cubes, which were strategically designed to allow the low winter sun to enter while blocking the high summer sun from overheating the interior. Vattenfall‘s contributions to the success of One Tonne Life are extensive. They provided all sorts of innovative ingredients to the energy recipe of the project. One such product is a unique solar cell, which in partnership with A-hus, was integrated into the roof and south-facing wall of the home’s shell (as seen in the image above). 40 square meters of these cells provide around 3,000 kWh a year of electricity, which isn’t spectacular by solar standards but extremely beneficial when considering that they can be utilized in ways which normal PV panels can’t. Vattenfall also placed more traditional solar thermal panels on the roof of the carport. These panels feed energy into two 300 liter storage tanks which is then transferred into the home where it provides hot water and space heating. Both forms of solar energy are on a system of net-metering, meaning that when they produce more energy than they use, the excess electricity is sold back to the grid. 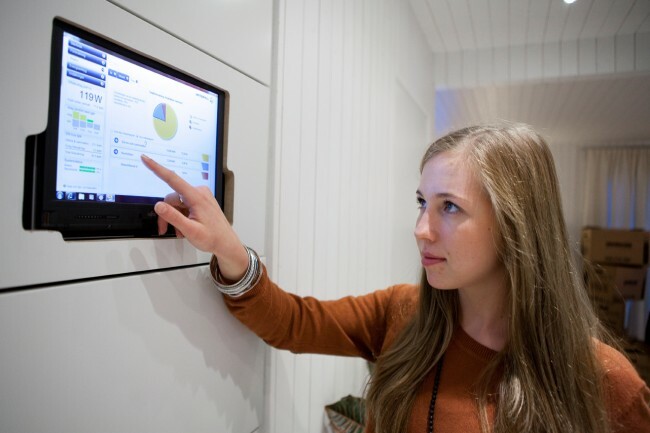 And speaking of metering, Vattenfall provided the Lindells with a pretty wicked monitoring tool called the EnergyWatch which connects directly to the home’s meter. This brings real time data of the building’s performance into the living room where the family can break down the effects each decision made has on their utility bill. If the Lindells were not feeling information overload at this point, they also were offered low carbon electricity options to support the energy produced on site. Vattenfall did an extensive Life Cycle Assessment of hydro, wind and nuclear power options per kilawatt hour impact. This info was then given to the Lindells to decide which backup low-carbon energy option was the best fit for their needs. 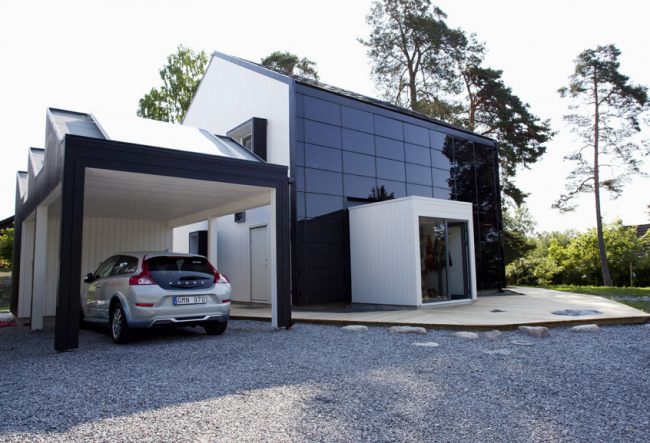 Furthermore, transitioning into the awesomeness that is called the Volvo C30 Electric, Vattenfall contributed the charging station in the carport which contains a measuring and communication interface that compiles data from the automobiles performance. The Volvo, yes, this electric ride of theirs is next-level! 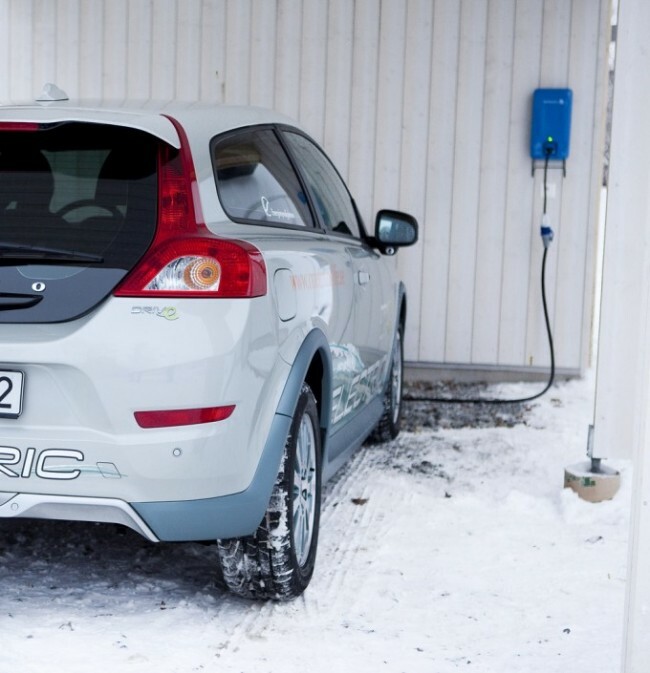 The C30 is completely electric and can be charged by a household socket or a roadside charging station. It takes about 8 hours to fully charge the car, and once it’s fully juiced can drive up to 150 km (94 miles), which is more than sufficient for the vast majority of a family’s daily needs. It is not a slug either, zipping from 0-60 in about 10.5 seconds while reaching a top speed of 130 km/hr. What makes the C30 particularly game-changing is when the electricity powering it is supplied by onsite renewable sources. Once this is accomplished, a true carbon-free transportation option is reached, outside of the impacts of producing the vehicle. Moving inside the home, two additional partners were introduced to further contribute to the Lindells reaching their one ton targets. The supermarket ICA has provided dietary consulting for the family, showing how significant food choices can relate to carbon emissions… Truth is, not many know that food contributes about 1/4 of a household’s climate impacts… pretty significant, eh? Appliance manufacturer Siemens also provided a line of their most efficient options to the One Tonners, with some producing up to 80% energy reductions over traditional appliances… To see how these various products and strategies fit into the One Tonne home, an online 3D walkthrough is available for all to see… it’s an incredibly comprehensive tool, so I highly encourage you to spend a couple minutes browsing the site… fun stuff!